Over the past year, the College has engaged in a campus-wide conversation to develop an ambitious action plan that creates opportunities in sustainability and climate action. Our goal is to further reduce Barnard’s carbon footprint—a goal that upholds Barnard’s mission as an academic institution valuing science, the free and open exchange of ideas, and the use of evidence in the development of policy and as the basis for practice. Why is Barnard so invested in this process? Because sustainability and climate action are at the heart of Barnard’s core vision and values. Join us for the annual senior seminar poster session to celebrate the accomplishments of Environmental Science majors. This year, the College hosted a workshop series in which faculty, staff, and students worked together to create a shared climate action vision statement. The workshops focused on consumption and waste, energy, the local environment, curricula and research, and campus culture. Participants tackled tough questions about the choices community members make individually and collectively on and off campus. At the end of this process, the Sustainable Practices Committee presented a draft vision statement with comprehensive proposals for operations, campus culture, and academics—examples include eliminating disposable plates and forks and making climate action a formal part of the curriculum. Members of the community can provide feedback to the climate action statement. In the fall of 2018, they will ratify the finalized plan. In 2013, Barnard celebrated early completion of the first phase of the Mayor of New York City’s Carbon Challenge. We met the proposed schedule early by implementing building and operation initiatives that reduced our Scopes 1 and 2 emissions by 30% from 2006 levels, and have signed up for phase two of the challenge, a 50% reduction by 2025. The College has installed an enhanced waste collection system on campus to support sorting of materials—including single-stream recycling—as well as a pilot program of compost collection in four academic buildings and more than 20 office suites. A revamped and expanded Give-and-Go Green program for promoting reuse during move-in and move-out. The College is increasingly integrating sustainability issues into its teaching. The Department of Environmental Science is now offering students the option to major in Environment and Sustainability. Students now have a choice of this new major as well as those in Environmental Science and Environmental Biology. In Professor Martin Stute’s Workshop in Sustainable Development, students worked as consultants to develop products for New York City’s Office of Environmental Remediation and the Black Rock Forest Consortium. One group of students developed marketing and communications materials while the other created interactive mobile-phone maps for researchers and visitors using a local scientific field station. In the class Introduction to Environmental Science, students track lead levels in soil samples from Riverside Park, getting a first look at environmental public health issues and learning how to follow a lab protocol. Students of Professor Brian Mailloux also test soil in the parks and public gardens in the Greenpoint neighborhood of Brooklyn. Mailloux is involved in a study that tests for levels of toxic lead in urban greenspaces. He and his students use testing kits, designed by Franziska Landes at the Columbia University Lamont-Doherty Earth Observatory, in collaboration with the NYC Urban Soils Institute. Students have the opportunity to participate in the Earth Institute at Columbia University, which brings together undergraduate, graduate, and PhD students at the annual Earth Institute Student Research Conference. Students discuss their unique research experiences of working to understand and solve pressing environmental and sustainable development issues. Barnard students Sage Max '18, Sarah Ortiz '20, Celeste Pallone '19, and Mimi Zimmer '18 are among this year’s group that has received support, guidance, or funding through an Earth Institute-affiliated education or student program, including a travel grant, internship, or research assistantship from the Institute. The Department of Environmental Science celebrated its 35-year anniversary in November. Its origins, however, reach as far back as Barnard’s first year, 1889, when students studied geology, geography, and mineralogy with Columbia University professors. Over the past 35 years, the department grew from one course to a department that is leading innovation in environmental research and education. 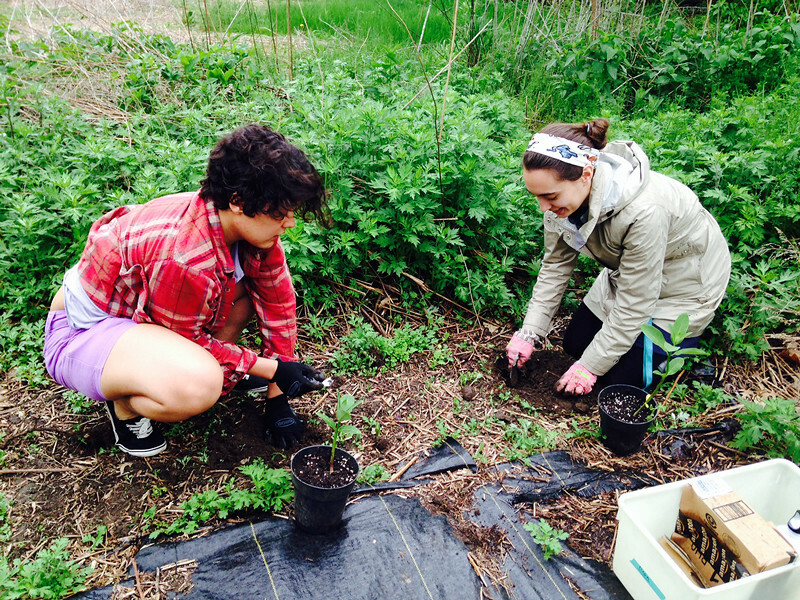 Barnard added a new major in Environment and Sustainability this academic year.